Sudden weaning, also called abrupt weaning, is the quick end of breastfeeding. Sometimes weaning has to happen quickly because of an unexpected situation that arises or a medical emergency. Other times, a mother may decide to stop breastfeeding on a particular date and wean cold turkey. But, whether it's chosen or something that can't be helped, sudden weaning can have more of an effect on you, your body, and your baby than you might realize. With sudden weaning, you may not have the time to prepare yourself and your child for the physical and emotional changes that you're likely to experience. When your body doesn't have a chance to adjust to the quick changes, weaning can be more difficult, even painful. Sudden weaning is the opposite of gradual weaning. When a child stops breastfeeding gradually, there is a slow transition from breastfeeding to another source of nutrition. If you have the option, it's recommended to wean in a gradual way. The slower tapering off of breastfeeding is easier on your body, so you may not experience some of the breast problems or other weaning related issues that can develop. Plus, gradual weaning is often less traumatic for children. Breastfeeding provides nutrition, but more than that it's a source of comfort and security. So, while some children can give up breastfeeding without a fuss, others will have a much harder time especially when it happens too quickly. Why Do Some Women Wean Suddenly? The start of a new medication: There are certain prescription drugs that you cannot take while you're breastfeeding. But, many medications are safe for breastfeeding women. If your doctor prescribes a new drug that's not compatible with breastfeeding, ask if there's an alternative that is safe. Of course, if your health depends on taking something that is not compatible with breastfeeding such as chemotherapy drugs to fight cancer, then you will have no choice but to wean during your treatment. Illness, hospitalization, or surgery: If you get sick with common illness, you should still be able to breastfeed. You don't have to stop breastfeeding if you have a cold or diarrhea. But, if you have a serious illness, you have to be hospitalized, or you need to have surgery, you may have to stop breastfeeding without any notice. On the other hand, if it's your baby who is sick or needs to be in the hospital, breast milk can be very helpful to your child. If possible, continue to breastfeed or pump for your baby. Separation from a child: When you have to be away from your baby for an extended period of time, perhaps for a military deployment or a long trip, you won't be able to breastfeed. If you plan to start breastfeeding again when you return home, you can pump to maintain your breast milk supply. You can even send your breast milk home to your baby while you're away. Of course, this can be a challenging and time-consuming activity, so many moms choose to stop breastfeeding instead. Pressure from others: The criticism and pressure from a partner, family, friends, or even a health care provider who doesn't support or understand breastfeeding can cause a mom to make the decision to wean suddenly especially if the child is a little older. A new pregnancy: It is not always necessary to stop breastfeeding because of a new pregnancy. But, since breastfeeding can cause uterine contractions if you are at a high risk of miscarriage or premature birth, weaning is the safer option. Weaning has physical, hormonal, and emotional effects on mothers. When you wean gradually, you have more control over the situation, so you can prepare and adjust to the changes over time. But, when weaning is sudden it can have a greater impact on you and your body. The abrupt end of breastfeeding can lead to painful breast engorgement. Hard, swollen breasts full of breast milk can cause a breast infection, plugged milk ducts, or a breast abscess. Breast engorgement can also cause milk fever. Milk fever can seem like the flu with symptoms such as fever, chills, and muscle weakness. It usually lasts a few days. Your breasts will continue to make and leak breast milk for a while. It could take many months to dry up completely. With the end of breastfeeding and the changes in the balance of hormones, your period and your fertility will return. With this, there will be a greater chance of becoming pregnant again. When weaning is sudden or unexpected, it can be disappointing. If weaning was not something that you wanted, it can make you feel like a failure and bring about a sense of sadness, anger, or guilt. Even if you felt tied down and you were looking forward to the end of breastfeeding, you may be surprised to find yourself feeling a little down when it all ends so abruptly. The sadness may be even greater in women who have suffered from depression or psychiatric issues in the past. Remove a little breast milk to feel more comfortable. If your breasts become engorged, you can hand express or pump some breast milk to relieve the pressure and ease the pain. But, you should only pump enough to feel better. If you remove your breast milk too much or too often, your body will continue to make even more. Wear a bra that's supportive but not too tight. Gentle, even pressure on your breasts can feel good. But, choosing a bra that's too restrictive or trying to bind your breasts to stop the production of breast milk could lead to plugged milk ducts or a breast infection. Use a cold compress on your breasts. Cold cabbage leaves or ice packs can relieve the inflammation and pain of swollen engorged breasts. With continued use, cold compresses can also help to decrease milk production. Keep breast pads handy. The engorgement from sudden weaning can build up the pressure in your breasts. 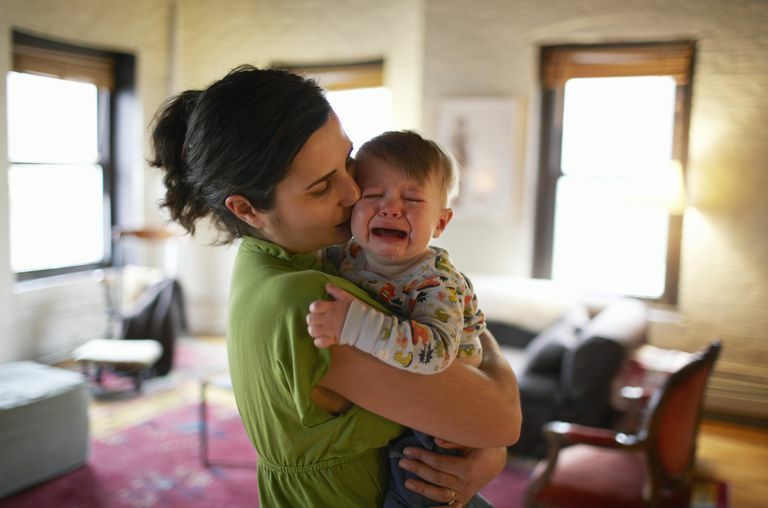 That pressure can cause leaking at random times, especially when you hear your baby cry. Be prepared and prevent embarrassing stains by wearing breast pads in your bra to soak up any breast milk that leaks out. Stay on top of the pain. The build-up of breast milk can be painful. Talk to your doctor about taking Motrin or Tylenol to help relieve the pain. Try some milk reducing herbs. Some mothers use sage, parsley, and peppermint to decrease the supply of breast milk and dry up more quickly. Seek support. Talk to your partner, your family, and your friends and let them know how you're feeling. You can also join a local breastfeeding group or reach out to other breastfeeding moms in an online support community. If you've experienced depression or a psychiatric issue in the past, talk to your doctor. Since the hormone changes can affect you in many ways, you may need to be followed more closely during this time. Gradual weaning allows a child to slowly adjust to a new source of food and the loss of the comfort and security that breastfeeding provides. So, when breastfeeding ends quickly, it can affect your little one in many ways. She may refuse the bottle, especially if you're the one trying to give it to her. She may have a difficult time giving up breastfeeding and understanding that breastfeeding has to end. She may be fussy, sad, or even angry at you for not letting her breastfeed. She may be more likely to get sick. Breastfeeding helps to prevent some of the common childhood illnesses so the sudden weaning of a newborn or young infant can put a child at a greater risk for ear infections and respiratory infections. If you aren't against using a pacifier, you can offer it to your baby to satisfy her natural need for sucking. See if your child would like a security item such a special blanket, or a teddy bear. If your child refuses to take the bottle from you, let someone else try to give it to him especially if he's never had a feeding in a bottle before. If your baby is closer to 6 months old, you can skip the bottle and transition him straight to a cup instead. Distract older children during the times you would normally be breastfeeding and start a new routine. Take a walk, play a game, or offer a big kid snack and drink. Give your child extra attention in other ways. You can replace those breastfeeding moments that you both miss with other tender moments of cuddling, singing, reading, and just being together. When you quickly and abruptly wean your baby from breastfeeding, you'll have to consider another form of nutrition. If you have stored breast milk in your freezer, you can continue to give your child breast milk. But if you don't have breast milk available, what you feed your baby will depend on your child's age. If you have a newborn or a young infant, your child's doctor will recommend an infant formula. A child between the age of 4 and 6 months can begin to eat solid baby food along with the infant formula. You can continue solid foods along with infant formula for one year. After your child's first birthday, more of her nutrition should be coming from foods, so you can usually transition from infant formula to cow's milk. However, some children use toddler formula instead of cow's milk. Talk to your child's healthcare provider about your feeding options and your child's needs. Academy of Breastfeeding Medicine Protocol Committee, 2009. ABM clinical protocol# 20: Engorgement. Grueger B. Weaning from the breast. Paediatrics & child health. 2013 Apr 1;18(4):1. Ystrom E. Breastfeeding cessation and symptoms of anxiety and depression: a longitudinal cohort study. BMC pregnancy and childbirth. 2012 May 23;12(1):36. Is It Normal To Feel Sad or Depressed When Breastfeeding Ends?